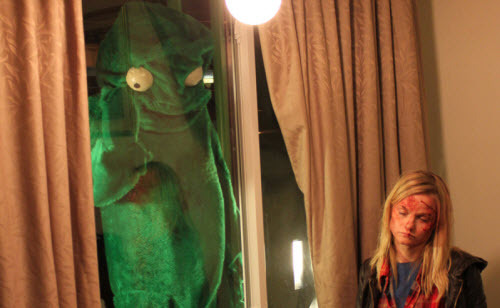 Film lovers and outside-the-box horror fans have had their eye on filmmaker Calvin Reeder since his visually stunning, terrifying and absolutely mind-bending short films that made the rounds at Sundance and in midnight-movie sections of festivals around the world. Garnering comparisons to David Lynch, Alejandro Jodorowsky and Luis Buñuel, Reeder is often categorized among directors who are themselves ride the edge of familiar genres. 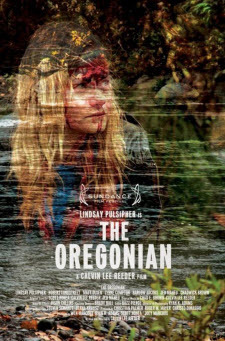 The Oregonian, Reeder's Sundance-selected first feature film (starring True Blood's Lindsay Pulsipher), looked and felt like it might be a horror movie, but was something else entirely. The film won an aptly titled special award for "Independent Vision" at the 2011 Sarasota Film Festival. While in the midst of finishing his latest feature film, Calvin took a few minutes to reflect back on the real-life fever dreams that brought The Oregonian to life, he and Lindsay Pulsipher's creative collaboration, and what he expects when his newest, star-studded feature, The Rambler, hits Sundance at the end of this month. If you want to hear more from Calvin, he'll be joining us via Skype after the AFS screening of The Oregonian. You can also view his short films online: Little Farm, The Rambler and The Snake Mountain Colada. Holly Herrick: Before making The Oregonian, you had made several great short films (The Rambler, The Snake Mountain Colada) that captured some of the visual themes you explore in the feature, such as terrifying situations of isolation and confusion, people stranded on the roadside, and a strange, colorful interpretation of gore. Would you say that making the shorts compelled you to push yourself narratively to explore these themes further in a feature? Reeder: I think so, it seems like most ideas I have come in pieces, and it's a struggle to connect them at first. Like in The Rambler short I knew I had this sort of cliché guitar rambler guy and I knew I there had to be a scientist. There was a bunch of other ideas that came with those characters but a lot of those ideas were really just color and sound. I guess it was a feeling I was trying to get out, it was my goal to give people that or something close to that. The Oregonian started in a similar way, I had this vision of a cruddy mascot with blue fur taking a shower that I couldn't shake but also couldn't really understand or finish. Months later I had a dream about being lost in a forest with a loud green glow, the feeling was somewhere in the dread genus but more playful and unknowable. It was difficult to pin down but it really stayed with me. It felt like the unknown itself, exciting. So when I started writing it the most important thing was stay true to that feeling. I embraced a few of my ideas that had previously confused me and really just made it my mission to probe my version of the unknown, go as deep as I could with limited means. That mascot ended up being green because the blue fur was too expensive, good thing too because it helped lock in the color thematically. Herrick: Every time I watch your films I am so refreshed by the originality of the world you create -- The Oregonian has the feeling of something found and familiar, and yet the action and the images are either totally other or grounded in very terrifying dream logic. It has a powerful effect. While you are doing something that is completely your own, I know as a cinephile you have probably been deeply inspired by other films and filmmakers. Can you share a little about some of the work that has influenced you, and whether what you see consciously makes its way into what you create? Reeder: I'm not sure I rank full-fledged cinephile but I try. I'm not really a completest but I love Pasolini's Porcile, Teorema and not all but a lot of Salo. Tarkovsky's Stalker and The Mirror were films I revisited after I decided to go ahead with The Oregonian, helped for sure. Nicholas Roeg films blow me away, the king of whatever it is he does. I guess I'm into all the stuff really, Antonioni really blew me away with L'Avventura and Red Desert but I also love Spielberg's Duel and Rami's Evil Dead 1, those movies are great for a guy like me because they really re-wrote the book on how its done with a low budget. Bulletproof achievements. James Szalapski's Heartworn Highways has probably left the deepest impression on me aesthetically. I saw it the day before we made Little Farm, it changed everything. I want to live in that movie. Herrick: Lindsay Pulsipher is the lead in The Oregonian, has appeared in your shorts and the two of you are collaborating again on your newest feature. In your preceding shorts, the roadside wanderer had been a male character, and you had played him. Can you talk about the choice to write this for a female lead? Reeder: The choice was so automatic that I don't even remember it. She was just there in my brain and on the page. She is the most vulnerable actor I've ever worked with and probably the toughest. If she said no I would have scrapped the whole thing. I'm really lucky to have her around, she's like a fifth ace with a suit all her own. I feel like I'm cheating somehow cause she's that good. Herrick: Yes -- Lindsay's performance is amazing -- can you describe how the two of you collaborate? Reeder: It's really simple, she doesn't want to do anything but act, and prefers not to improvise. I'm a control freak but usually give her minimal direction and freedom. She's always prepared and character ideas she has always seem to be on point. She goes right to work, very low maintenance and elevates every project she's in. Really really lucky to have her around. Herrick: The Oregonian could be placed in a number of different genre terrains: horror, psychedelia, 70s road movie, experimental art cinema, even comedy ... is it interesting to you to see it interpreted from these various vantage points? Is there a particular kind of film that you feel is "spiritually" aligned with where you were in making this? Reeder: Ya know, it's interesting to me that it's interpreted at all. I feel like one of the lucky ones that gets to have an audience, the movie is really different so how ever they choose to interpret it is totally legal. Jodorowsky's Fando and Lis may be its ancestor, It's not the same but I think people who like that movie will like this one too. Herrick: We programmed The Oregonian as part of a series highlighting the work of the indie distribution label Factory 25, who we think are wonderful curators of up-and-coming American auteurs. Can you describe what your goals were in distributing The Oregonian, and your choice to work with Factory 25? Reeder: My goal was to get it in front of people any way I could, Sundance helped that a bunch with their artist services program. I met Matt Grady at the Maryland Film Festival and right away I wanted to be a part of Factory 25. He understood the film and I felt it would not get buried in the catalog or be misplaced in the discount horror bin. I got the DVD and vinyl package in the mail last week, it was really exciting. One day all this DVD and Blu-ray stuff will all be online and totally disposable, Factory 25 makes stuff that will survive the apocalypse. I also love that with them it's not about getting it in front of the unwashed masses but about getting it to the right people who are curious about this kind of thing. The movies will live longer that way. Herrick: You are about to head to Sundance with your newest feature film, The Rambler, which also stars Lindsay Pulsipher, this time along with Dermot Mulroney and Natasha Lyonne. Can you share a little about what you are excited about with the new movie, as you are anticipating it being in front of an audience in a few weeks? Reeder: Geez, I am excited but its mostly nervous excited. Sundance has been a dream come true for the most part but its also been a nasty sucker punch at times. I've been told that The Rambler is The Oregonian on steroids. The Oregonian taught me that premiering a movie at a big festival is a little like standing naked before a firing squad. Whatever happens I definitely asked for it. Herrick: Anything else you'd like to say to the Austin audience before they sit down for The Oregonian? Holly Herrick is Associate Artistic Director of the Austin Film Society.